Influenza A viruses tend to garner most of the attention, but let’s not forget that there are two other virus types, B and C.
The enveloped influenza A virions have three membrane proteins (HA, NA, M2), a matrix protein (M1) just below the lipid bilayer, a ribonucleoprotein core (consisting of 8 viral RNA segments and three proteins: PA, PB1, PB2), and the NEP/NS2 protein. It would be difficult to distinguish influenza A and B viruses by electron microscopy, but there are differences. Influenza B virions have four proteins in the envelope: HA, NA, NB, and BM2. Like the M2 protein of influenza A virus, the BM2 protein is a proton channel that is essential for the uncoating process. The NB protein is believed to be an ion channel, but it is not required for viral replication in cell culture. Influenza B viruses cause the same spectrum of disease as influenza A. However, influenza B viruses do not cause pandemics. This property may be a consequence of the limited host range of the virus – humans and seals – which limits the generation of new strains by reassortment. The virus causes significant morbidity: in the US in 2008, approximately one-third of all laboratory confirmed cases of influenza were caused by influenza B (as shown on the first graph on this CDC page). Consequently the seasonal trivalent influenza vaccine contains an influenza B virus component. Influenza C viruses are somewhat different (there is a nice diagram here). The enveloped virions have hexagonal structures on the surface and form long (500 microns) cordlike structures as they bud from the cell (image below). Like the influenza A and B viruses, the core of influenza C viruses consists of a ribonucleoprotein made up of viral RNA and four proteins. 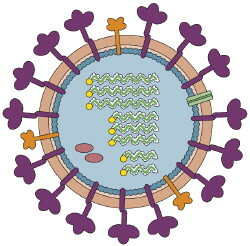 The M1 protein lies just below the membrane, as in influenza A and B virions. A minor viral envelope protein is CM2, which functions as an ion channel. The major influenza C virus envelope glycoprotein is called HEF (hemagglutinin-esterase-fusion) because it has the functions of both the HA and the NA. Therefore the influenza virion contains 7 RNA segments, not 8 RNAs like influenza A and B viruses. I know influenza B and C viruses quite well – I did my Ph.D. research on them. I showed that the influenza C virus genome consists of 7 RNA segments, and demonstrated reassortment among different influenza C virus strains. So, basically, influenza C is one more of those viruses that more-or-less just gives you a cold? Do viruses ever reassort across these lines–like influenza A and C exchanging HA genes or something? That's correct – influenza C causes mild upper respiratory tract infections with cold-like symptoms. Reassortment among the three influenza types (A, B, C) does not occur. and that flu C can be sooo long. So, flu B jumped from birds to humans 4000 years ago, I read. Flu C 8000 years ago and then they kept in humans. Flu-A still tries to get a foot in mammals but didn't succeed the last centuries. Is there a difference between being diagnosed with Influenza A and H1N1? There are many at my school who are being diagnosed with Influenza A, but aren't having further testing (due to cost, or known exposure). How are we supposed to know who actually has H1N1. Those with Inflienza A do not want to stay away for the required 5-7 days after diagnosis. Is there really a theoretical basis for this? I was wondering if you could help me clear up some things. I was watching this video by Barbara Loe Fisher from NVIC: http://www.youtube.com/watch?v=n25v5S9PMS8. At 2:29 she starts talking about natural longer lasting antibodies. What's the difference between “natural” antibodies which are made as a response to the virus and the antibodies that are made as a result of antigen in the vaccine? Also, i would like no know how the flu seasons are going to look like in the following years. Is the current H1N1 virus going to come back every year? So, should we get a flu vaccine now to prevent the common flu and wait for the H1N1 vaccine later? Won't the H1N1 vaccine cover both? There is no difference. Antibodies are all made the same way by the body in response to the introduction of a “nonself” epitope. In the vast majority of vaccines, the antigen *IS* the virus, in a form the body can easily fight off like attentuated, inactive, or a controlled low dose of active. my kids (2, 4, 6, ) and i have been sick for a while now. we had flu symptoms but they didn't test us for h1n1. now there are 10 kids or so with confirmed cases of swine flu out from my 6yr old's school. is there a way to test to see if you were already infected with the virus? we all have brochitis now and i'm afraid to send him back to school because we are already sick and i'm 7 weeks pregnant. they don't have the vaccine here yet or for the regular flu. and i still haven't decided if we are going to get the vaccine due to all the contraversy about long term neurological effects. I really enjoyed this blog. It is very informative. could I ask why there is no vaccine against Type C Influenza Virus? I wonder why they classified the viruses as A , B and C. Is A short of something or just the first letter of the alphabet? It's just the first three letters of the alphabet. Can A, B, or C create a constant bad smell/disoriented smell in your nose and a several week stomach ache along with other symptoms (chills, fatigue, headache etc). Influenza B virus has a limited host range – humans and seals – which limits the generation of new strains by reassortment. Can the recombination not cause a pandemic? Why can't reassortment occur between A, B and C? It's not known why reassortants don't occur among the influenza types. can i ask mr profvrr that i can target active site or cleavage site of HA so that it does not recognize the receptor? hi can i ask what is the pathognomonic sign of influenza a, b & c? what is the incubation period of influenza a, b, & c? what are some examples of when the flu virus has changed through antigenic shift or drift? are examples of antigenic drift. I heard that only Influenza type A leads to pandemics situation since type B (or C) Influenza has only one HA and NA type. I don’t understand why the types B and C have only one HA and NA type when the type A has a lot of different ones. And I don’t understand the link between this and the capacity of producing pandemic. Your website is providential, thank you for sharing your work. I would imagine that the reasons for multiple HA and NA variants in influenza A are mainly immuno-selection and a large host range allowing lots of unique divergence. The capacity for influenza A to producing pandemics is due to antigenic shift. This occurs when two distinct strains infect the same host, leading to a re-assortment of viral RNA segments; most importantly, the segments coding for the membrane proteins, HA and NA. In this way, the two distinct virus strains are able to combine, creating a new strain. When a strain emerges as a result of re-assortment between two viruses derived from animal reservoirs, the human immune system is often caught off guards, so to speak, and as a result the virus can be highly infectious. Is there a strain of Influenza virus which does not undergo antigenic shift nor drift? I understand that A can undergo both and B can undergo the latter. Thanks in advance. i do have a question about proteins found in type B influenza i.e. 1.- N.B. and 2.- BM2 instead of M2 of type A .both of them are membrane protein but the exact or possible propposed function or mode of action of N.B. and BM2 is not clear to me.wheather it is possible that they produced from cleaving of HEF of type C ? Do you have any papers on the influenza vaccine and how it works at the biochemical level? Influenza C only has 7 virions, does it ever have 8 virons? How does the viral package work? If someone is infected with C and A or B can a viral particle be made that has mostly C but an artifact from A or B?